Communism and monarchy are some of the various forms of governments the world over. Through these organizations, leadership authority is exercised, as well as administering and controlling public policy as the government performs direction and control of its subjects. As a government grows, so does its complexity. Small governments will be easier to run and have simpler structures than large governments, which will have several interlocking levels of administration, hence more complex to administer. Governments were formed as societies grew and people’s needs and expectations increased. One of the oldest forms of governance was monarchy. In basic terms, it is the type of rule presided over by a single individual who acquires power through inheritance and in turn will bequeath power to an heir. In a monarchy, power runs through a single family and the state is considered a private estate of the ruling monarch. Often, the monarch may not himself hold real powers but instead, regents, courtiers, ministers and power allocation is done mainly through palace intrigues. This type of monarchy is more common in recent times where a monarch has no absolute power (a monarch’s word is not an unchallenged law). Over time, majority of monarchies transformed from absolute to constitutional monarchy, where the monarch presides over the affairs of the state within the limits of a written or unwritten constitution. Some monarchies employ a parliamentary system, in which case the monarchy’s duties will only be limited to a ceremonial one. An elected prime minister heads the government and has full political power. Contrasting with that is the system of communism. Communism is characterized by a classless social structure where individual ownership of property isn’t possible but rather is carefully controlled. The political philosophy and social movement are geared towards a society with no classes. The Marxian definition of communism states that it is a society that is stateless, classless and free of oppression where every member of society can make decisions on policies to pursue, politically and in everyday life. Every member works and there’s collective ownership to the means of production. At present, communism refers to the policies adopted by the different communist states, which mainly is comprised of authoritarian regimes which centrally hold all powers to plan for the economies and all production means. 1. Monarchy is the rule by a single family through inheritance while communism is a classless system with no ownership of property. 2. In a monarchy (absolute) the monarch singly yields all powers while in communism, there’s collective decision making by all members. 3. A monarchy is characterized by a society highly based on class while in a communist system, classes are nonexistent. Kivumbi. "Difference Between Communism and Monarchy." DifferenceBetween.net. 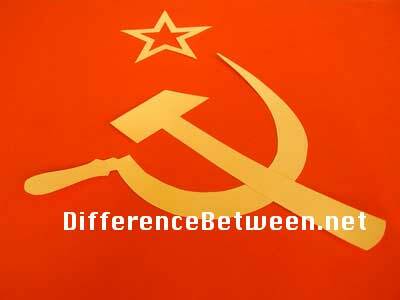 May 19, 2011 < http://www.differencebetween.net/miscellaneous/politics/difference-between-communism-and-monarchy/ >. Communism is an ideology based on Karl Marx’ “Das Kapital” and other authors of the 19th and 20th century. It is not a form of government. Nor is a monarchy a form of government, but a form of state. Under a crowned head of state many different form of governments are possible. A parliamentarian monarchy like Sweden has little in common with a traditional monarchy like Saudi Arabia. Even the German Kaiserreich of 1871 to 1918 was incomparable to other monarchies and was by many jurists considered a federation, even a republic. Communism has proven itself unworkable as the reality of communist societies is that the communist party formed an elite and held all power. The people within a communist society must be closely controlled to prevent thought as this would endanger the power of the communist party. How is this then different from a monarchy? i think communism is ideologically better sounding, as everyone is equal. in school, everyone will get he same grade, which means that the difference will be unnoticed. smart people and stronger people will have to do the same work, to keep the idea of communism and everyone is equal. monarchy on the other hand is very dependent of the monarch, a bad monarch will result in rebellion, while a good monarch could keep the country in order. communism has flaws even in the ideology, while though monarchy may sound bad, it is actually OK if practiced well. It seems to me that Communism is a scam that was cooked by power hungry, greedy cowards. Rather than risk their own yellow necks in order to usurp a ruling monarch, they get the people to do their dirty work for them through “revolution”. Once in power, the parasitic spin doctor and his blood sucking cronies set up shop and oppress the people and rob the country of its life’s blood. Communism is a lie, in which its proponents make grand promises that they never intend to fulfill, and are impossible to fulfill. Too many chefs spoil the soup. People have been sold the ridiculous ideology that society should be “classless”, and that everyone should be “equal”. Ironically this “equality” maximum held by evolutionary communists goes against their most cherished belief- the strong survive and evolve into higher lifeforms, while the weak die off . But their ideal, a superior race, never happens, because there is always the weak among the strong. The true test of a good and healthy society lies in how they treat their helpless ones. Here are yet more classifications: the industrious and the lazy, the leader and the follower, the smart and the stupid – you can’t get away from classes. The real difference between a monarchy and communism is the trade off between one person’s absolute rule for the absolute rule of many. Is one tick on a dog better than 666 of them? You tell me. A good monarch is one who knows the importance of being a good father. The monarch who cherishes his subjects and desires to provide them a good home, and protects them, and even knows the best way to reward the good children, and discipline the naughty ones – that is a good monarch, but the world has seen far too few of these goodly and benevolent kings, and far too many communists.